Mash the keerai nicely in running water and chop them. Boil with little water with turmeric powder and keerai for five minutes. Take a wooden matthu (it is called keerai matthu) or grind coarsely in blender. Heat a pan with oil add mustard seeds, asafoetida,chili and urad dhal. When it splutters add the mashed keerai, salt and rice powder. Let it boils once. 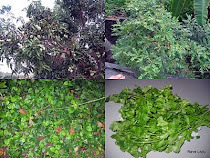 Keerai masiyal is ready. 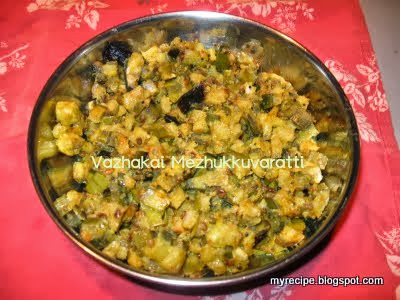 VathalKozhambu and keerai masiyal is good combination. It is a side dish for sambar/rasam rice. Cut the banana with the skin( skin is very good for health) into small pieces. Boil with turmeric and salt.